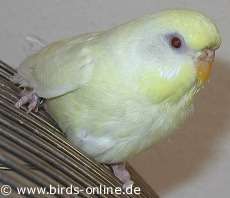 It's unlikely that she has spent a lot of time in her former home, because when I went to the animal shelter of my hometown and got this budgie lady, she still had this special sparse plumage that is typical for budgies who are between six and ten months old. For sure the shy bird must have been glad when she arrived at the animal shelter. The reason is that the state of her plumage was telling a sad story about her former life. It was worn to threads because the bird has been treated badly. People must have pulled her tail feathers what is a very unpleasant experience for a bird. Since Fralie also feared hands and was extremely jumpy when she came to my place, I'm sure she has been mistreated in her former home. Also flying through the room seemed to be something she didn't know these days. The 07/07/2006 was a special day for Fralie and her white friend who also moved to my place. For the both of them it was the beginning of a new chapter in their life - hopefully a better one. 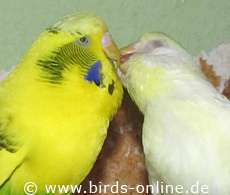 Here at my place, Fralie has never been harmed by humans and she hapilly lived together with other budgies in my bird room where they have the opportunity to fly the whole day long. It took only a few months until she learned that I wouldn't harm her and she started to trust me. Very soon she became so tame that she loved to perch on my hand. And also she learned to fly and she seemed to be very happy in this new surrounding where she could be together with so many feathered friends. Since she was so reserved at first, it was quite hard for her to make sure the male birds would take notice of her. 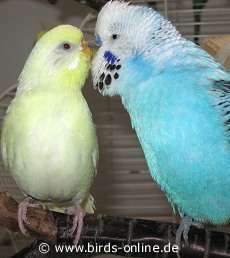 She seemed to like Pollux but he belonged to another budgie-lady. So Fralie had to be patient and wait for another opportunity. In spring 2009 her waiting was over: Speedy fell in love with her and they were a happy couple for one year as you can see in the photo on the right. Regrettably he died much to young in spring 2010. Fralie was very sad, but there was somebody who wanted to comfort her. She soon realised how friendly Woodstock was. Since he was so tender and kind, she soon fell in love with him and they were a pair until the day she died. The photo below shows her together with Woodstock. In 2009, Fralie showed the first symptoms of a mysterious neurological disease. From time to time she suffered from seizures and my avian vet examined her. But regrettably he couldn't figure out the reason for her health problems. She has been treated with some drugs that improved the blood circulation in her head and she soon felt better. This stable health status lasted for a while, but then in July 2011, Fralie suffered some seizures again. And also a swelling appeared in her abdomen - most probably a tumour. Since she felt very bad, I decided to take her to the vet on 07/30/2011. There was no hope for her and so poor Fralie has been put to sleep. I miss her so much because she was such a lovely little bird. 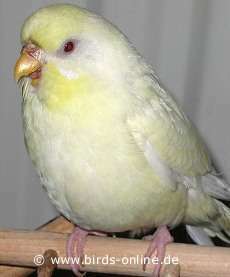 Fralie's colour mutation is called Albino Yellowface. This means she was a white bird with a slight touch of yellow in her plumage (not as bright as the Lutinos are) and red eyes. 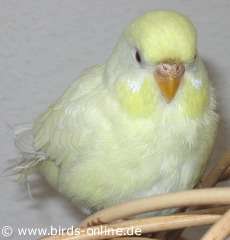 This budgie's name origins from a book of the Earth's Children series which has been written by the American author Jean M. Auel. One of the characters carries the name Fralie. This young woman belongs to the clan of the Mamutoi and the main character Ayla meets her at the lion camp. Because I liked the sound of the name I chose it for my budgie.